I’d never had spaghetti squash until last night. I’d heard of it, but never tried it. Something about putting spaghetti sauce over squash didn’t sound right. My brain was like “puhlease! I will totally know I’m being short-changed”. 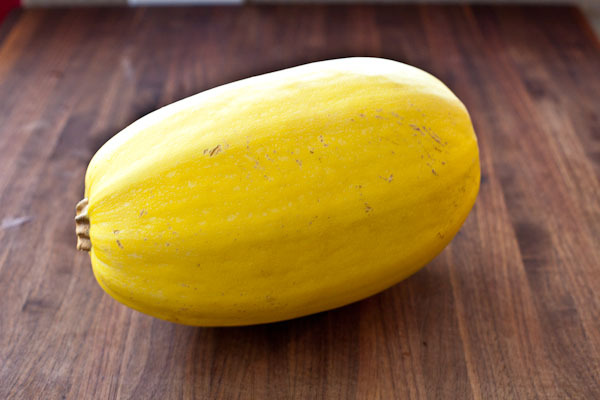 Then yesterday I came across another article mentioning how great spaghetti squash is, as a replacement for pasta, especially when you’re trying to watch your weight. So I decided to try it. 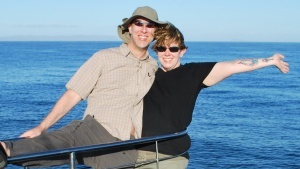 I’m finally losing my “wedding weight” – woohoo! 23 pounds down, 19 to go. So, in the name of getting healthier, I’ve been giving healthy foods I knew I hated another try – like raw cauliflower, reduced fat cheddar cheese, & dark chocolate. And now I love them! 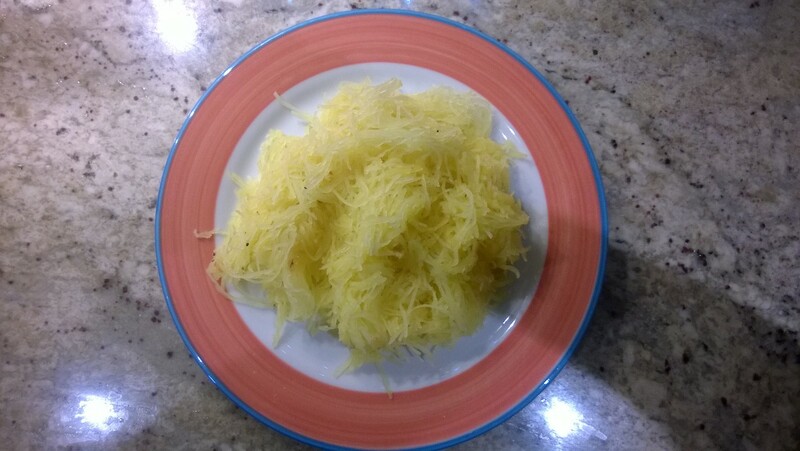 So I decided it was time to try spaghetti squash. I went to the grocery store after work and bought 3 squashes [I wasn’t sure how much “spaghetti” each one produced]. The internet suggested oven roasting them, and since I LOVE oven roasted vegetables I figured it would put me ahead of the game in terms of liking them. I preheated the oven to 400, then set about cutting the squashes in half the long way. OMG that was hard! It takes a huge knife [thanks again Uncle David & Aunt Jean for the awesome set of Wüsthof knives you gave us for our wedding present – I use them daily!!!] and a lot of muscle to wrench those things apart! I ended up driving the knife into just one side of the top, right up against the stem, and sliced downwards towards the counter. Then rotated the squash and cut down the other side until my slices met. Then I scooped out the seeds, put the squash halves face-down on a baking sheet, and baked them for 45 minutes. After my squash were done baking, I took a fork and gently scraped out the “meat”. It comes out in long tendrils that look just like spaghetti – fascinating! I measured out 2 cups for myself and about the same for Jim [and there was about 3 cups leftover]. I put jarred spaghetti sauce and Kraft grated Parmesan cheese on mine [because I’m classy like that]; Jim put pesto and fresh grated Parmesan on his. It was sooooooooooo good – OMG! 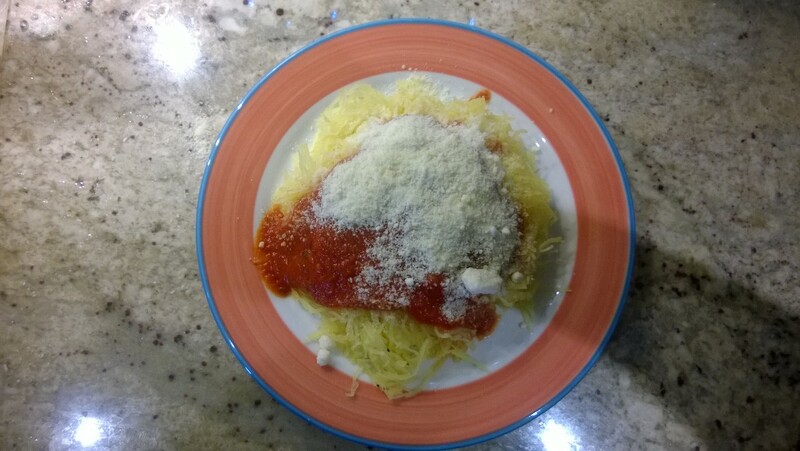 Here’s what 2 cups on my plate looked like before and after I added sauce and cheese – tell me that doesn’t look like a big plate of spaghetti! 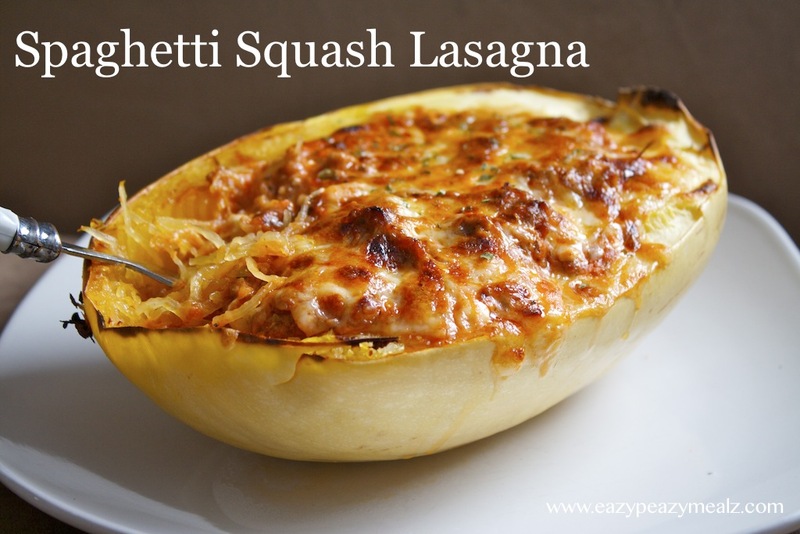 On a side note, here’s a picture of “Spaghetti Squash Lasagna” I found while looking for pictures of squash – *drool* – I am SO making that this weekend!!! I tried the spaghetti squash lasagna and wasn’t too impressed. 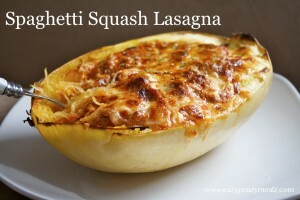 I liked the squash MUCH better the way I did it the first time, on a plate with some red sauce and Parmesan cheese. Numnumnum! 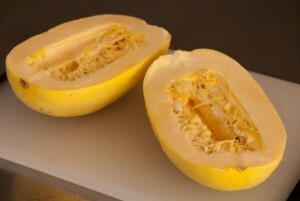 I’m going to try spaghetti squash- and I’ll follow Lyn’s cooking directions. BUT, my luck, vent hole or not- it’s definitely going to blow up when I microwave it. That should be interesting! Guess I know what we’re having for dinner tomorrow night! Oven roasting it makes so much sense! Thanks! So helpful. I bought a spaghetti squash once and couldn’t cut it in half! You have given me the impetus to try again. awesome! I hope the microwave trick works… they’re beastly to cut in half otherwise! You totally should! I can’t wait to eat the leftovers tonight!